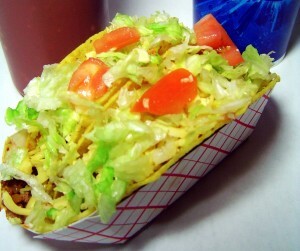 “A taco that is pure taco” raved the Washington Post Magazine dining review. Have yours made to your liking by choosing either a crisp corn tortilla shell or the soft flour tortilla shell and having it filled with meat, beans or our spicy chicken. Topped with cheese, lettuce and tomato, they are sure to please.